"We must remember. If we do not, the sacrifice of those one hundred thousand Canadian lives will be meaningless. They died for us, for their homes and families and friends, for a collection of traditions they cherished and a future they believed in; they died for Canada. The meaning of their sacrifice rests with our collective national consciousness; our future is their monument." "On November 11th Canadians all across the country will stop and pay tribute to the men and women killed in Canada's wars and military operations. Some will remember friends and relatives long dead. Others - like yourselves perhaps - will pause in tribute but will really have nothing to remember." 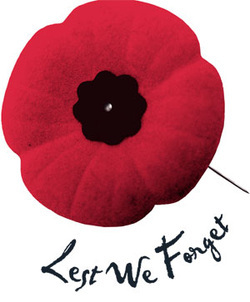 ​Today we took time to reflect on the significance of Remembrance Day as a class in order to make the Paraliturgy we attended this week more meaningful. We spent time exploring topics on the many wars and peacekeeping operations the Canadian Military has partaken in during the last century. It is my intention that we never forget the sacrifices that the men and women or our armed forces have undergone (and are undergoing) in order for us to live without oppression and fear. We researched information off of the following excellent resources. Take time to check these out. You won't be disappointed. Finally, we took time to watch the exceptional CBC documentary entitled, "We Will Remember Them"
that chronicles the lives of the first 150 Canadian soldiers that died in Afghanistan since 2001. The documentary pays tribute to Canadian fallen soldiers through the eyes of family, friends and fellow soldiers. Heartwrenching and informative, you can not watch this video and not effected.